The Hello Ortho team defines the spirit of Napa Valley. They’re happy, relaxed, and all-around cool people and wanted their orthodontic practice to embody the relaxed Napa feel without resorting to the typical wine theme. Since outdoor leisure games like bocce ball, croquet, and horseshoes are extremely popular, Hello Ortho went with this outdoor games brand idea. To capture the beautiful Napa sunsets, we put a warm, pink filter on all the photographs. Copper accents were used throughout the deliverables and in the renovated office. Even though the practice is extremely advanced technology-wise, the team wanted any physical piece the patients interacted with to be fun and engaging—hence th grommeted business card, the patient reward wheel, and the “rope in a friend” referral card. The Playbook for Hello Ortho was designed to help patients “master the game of orthodontics”. This 36-page book was developed from the consolidation of a 72-page Word document, 5 laminated cards, and one large pocket folder. Hello Ortho was tired of giving patients this stack of information because no one was reading it. 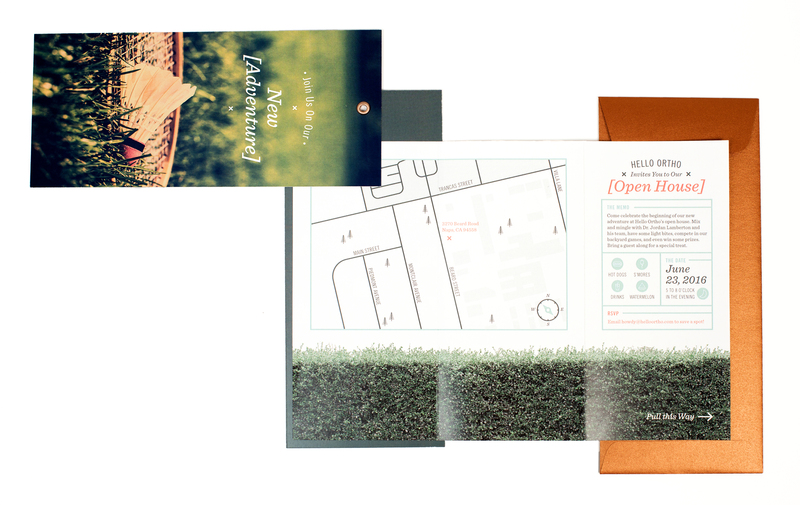 Since we developed the brand around outdoor leisure games, we thought a “playbook” was the perfect medium to present that material. Throughout the playbook, the tone, voice, and visual all align with this theme. It’s one playbook they’ll want to read.